It is party season again in our neck of the woods. There are a lot of birthdays in November. I enjoy going to the kid's parties....it's special to celebrate the birthday child, it's fun for my kids and I get to catch up with the local mums in a relaxed setting. I also enjoy seeing how the parents celebrate. Sometimes the parties are very simple; a shop bought cake and a play in the park. Sometimes they are themed down to the very last coloured lolly. I love both style of parties and everything in between and I've done a little bit of both. For me, birthday parties are a great avenue for creativity and as long as I'm not stressed about it then it's a fun little project. Here is my son's 1st birthday cake. There are a lot of serviettes available for that little cake. A teddy bear theme for number 2. Number 3 was all about the farm. We had fun with a jungle theme for birthday number 4. You can tell I have two kids here and even less time and energy...nice and plain! Another super easy one for at the playground for Master 4, even the icing is incomplete. He didn't notice. The firie bath squirters put out the flames, of course. 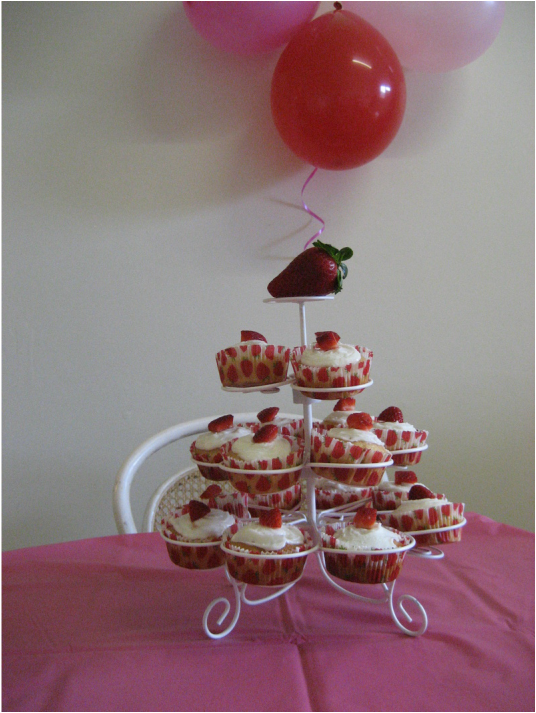 I did a "Berry 1st Birthday" theme for Little Miss, lots of red and pink. I love the simplicity of cupcakes, so easy and attractive. My friend who loves gardening celebrated her birthday earlier this year so I surprised her with this creation. I enjoyed this one, especially shopping for 'vegetable' lollies. Birthday number 5 was monsters. Why am I showing you my amateur cake skills? Well, because my birthday is coming up and I am thinking about cakes. Did you notice a theme here at all? Lots of homemade and decorated cakes for the kids and one for a friend in 5 years. This year I am going to make one for me. Nice and simple....cos that's what I do. I might even buy myself some lollies or a toy to put on it. I'll let you know. PS. If you like professional homemade and decorated cakes , check out Cakes and Chocolates by Donna. She is one talented lady. 'Five Blessings for Busy Mothers' by Monique Seymour. Today I have a very special guest, my friend Monique. Monique has been an inspiration to me since we met and it is with great pleasure that I share this beautifully written piece of mothering wisdom with you. Allow yourself to receive its wisdom and beauty. Daily Gratitude allows our contentedness to bloom, where before we eroded our Happiness with expectations and resentment. Gratitude rituals make the small and simple blessings in our lives more meaningful, and in reverse, puts our bigger problems and frustrations into clearer perspective. Gratitude is not only acknowledging what's good in our lives and ignoring the bad. It is actively looking for the positive, or the lesson, within our difficulties. Forgiveness allows you to start each and every day of your Mothering Journey as though it were your first. Let go of yesterday - its' mistakes and regrets - and begin today anew. Don't allow unpleasant memories and thoughts of the past to define you, or be the measure of who you are. Simply acknowledge the feelings or lessons from unpleasant moments, and re-invent yourself each day trusting you have gained new insights and skills from those moments. I also wish for you Forgiveness of Others. Remembering that everyone is on their own learning journey allows us to forgive others' mistakes and regard them with compassion. In our relationships, discovering these forgiveness lessons together can be some of the most powerful learning, and loving, experiences. I wish for you the skill and wisdom to clearly recognise your own most important needs, and the commitment to be able to meet them. As a Mother, it is easy for your own needs to become ignored or completely lost, and it becomes difficult to even realise or recognise what they are. It might sound crazy, but create Balance in your family by allowing your own needs to rate highly. Listen to your inner voice for guidance on what you really need and speak those needs without fear or guilt. Self-nurture is key to fuelling your ability to nurture your children, partner, and family. I wish for you spaciousness in heart, mind and soul. This feeling comes to me when I exercise or meditate. A feeling of spaciousness allows you to slow down life's rush, think with clarity and compassion, and be inspired and ready for change. Without it, the constant changes of life arrive while we're unprepared and we flounder under their weight. Spaciousness of heart allows us to love generously and unconditionally, spaciousness of mind allows us to remain calm amidst the chaos of family life, and spaciousness of soul allows us to remain true to ourselves and not lose sight of our direction. I don't mean superficial beauty. I mean the deep beauty that emanates from within you and flows out to colour your world. Everyone has it but not everyone shares it. Allow your inner beauty to flow into all the corners of your life. Consider the beautification of your home and spaces, consider the beauty of your voice and the words you choose to speak to your children - sing to them. Consider the sounds you make in daily life - are you clanging and banging, or are you doing a graceful dance of domesticity? Consider your self-care as a way of beautifying your soul by richly nurturing yourself. All these considerations of Beauty can become an excellent exercise in mindful living. Allow your deepest inner beauty to shine in all you do. You are brimming with it, so share it with generosity. Monique Seymour is a mum to 3 children aged 8, 6, and 4, and step-mum to a 15 year old. She chooses to be busy most of the time with family life, and strives for a happy balance between nurturing others and nurturing herself. Monique wrote 'The Five Blessings for Busy Mothers' for a friend's Motherway after reflecting on some of her own mothering challenges. I am really enjoying playing with these simple and effective sacred circles. You can read my previous post on them here. Have you tried drawing one yet? They truly, truly, don't require much artistic skill and they are super satisfying. I've tried a few different methods now and my favourite so far is using coloured pencil with a compass to help me plot some points and then outlining the design with felt tip pen later. Sometimes I do them alone, sometimes I do them with the kids. Sometimes I play meditative music, sometimes I don't. Sometimes I interpret the piece's meaning, sometimes I don't. Sometimes I use a compass to help me with the symmetry, sometimes I don't. Sometimes I use coloured pencils or textas and sometimes I just doodle one with a pen and paper. If I haven't inspired you yet, maybe this video I found on Youtube will. I call these ones mandala doodles. I was trying to think of a creative name for them but the only thing I could come up with was Mandoodle and that's just not right.